Who knew permeable concrete could be so beautiful? This project demonstrates the artistic options possible with this eco-friendly material. Here's the original artwork that was replicated in permeable concrete. 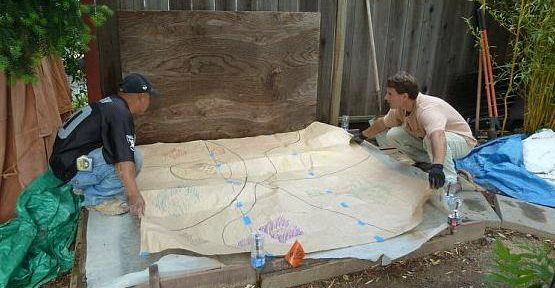 The artist's design was transferred onto paper and placed over a permeable concrete base. 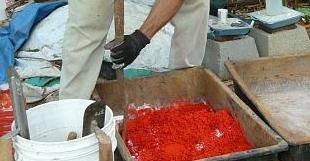 Each color of ultra-fine permeable concrete was mixed separately. Placing the colored ultra-fine permeable concrete for each section. The artist, checking the work in progress. Pervious concrete pavements have many environmental benefits by allowing water to percolate back into the soil, replenishing the water table and preventing stormwater run-off. But Ryan Marlinghaus, president of EarthCare Landscaping, has taken permeable concrete to a whole new level as an artistic medium for decorative applications. 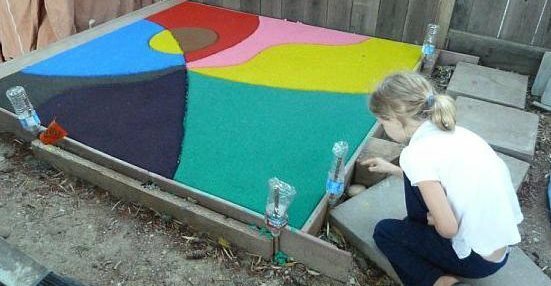 On this project, he replicated a child's artwork in permeable concrete, and it is the centerpiece of the homeowner's backyard garden. "The client, who is a part-time landscape designer, had asked us to replace her existing fines in between her flagstone with our pervious flagstone grout," says Marlinghaus. 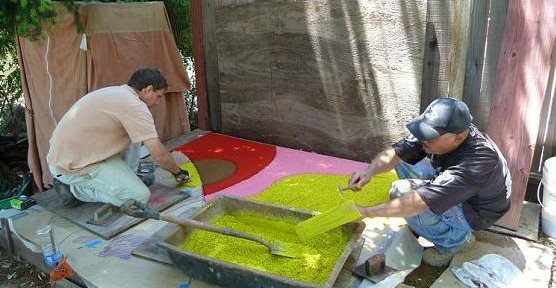 "When we were there doing that work, I introduced her to pervious concrete and showed her some of our brightly colored samples. She really liked the idea of pervious concrete for environmental reasons and was looking for a way to incorporate some into her garden. 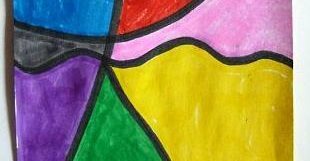 Shortly after I showed her the samples, her young daughter did that art project for school, and the client immediately thought of those colors." 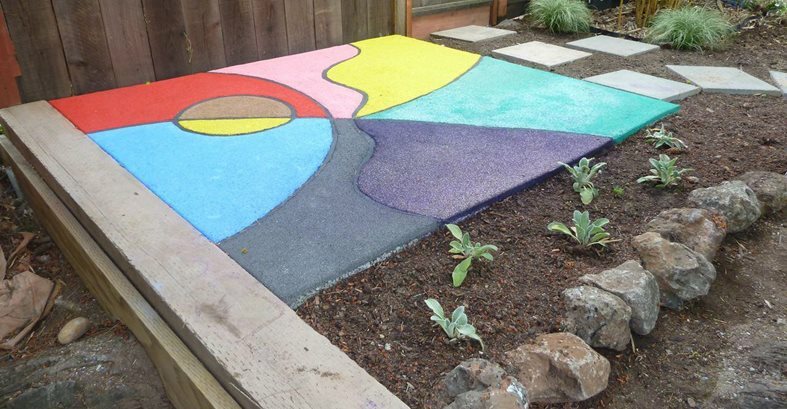 The finished piece is approximately 6 ½ x 6 ½ feet and is located in a special area of the client's garden just for children. Marlinghaus used two separate permeable concrete mixes for this project -- one for the base and an integrally colored "ultra-fine" mix for the decorative surface. For the base, the mix combines 3/8-inch pea gravel, portland cement, a retarding admixture and a blend of fibers. The topping mix is a proprietary blend of special aggregate with portland cement and admixtures. 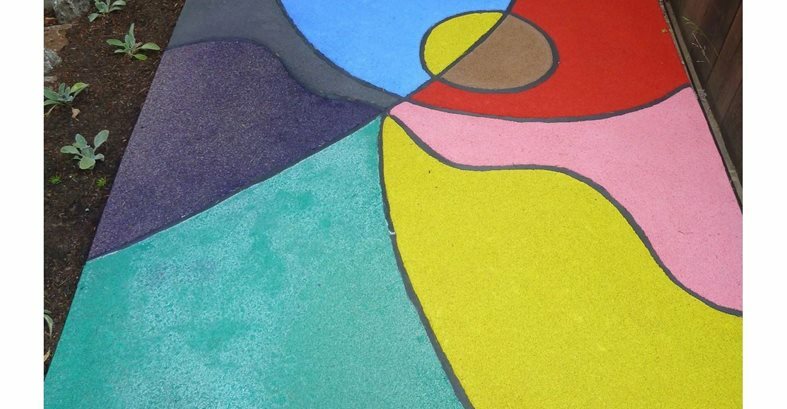 The integral colors are a combination of powdered pigments supplied by Davis Colors and Blue Concrete. "On installation day, we mixed the base pervious concrete, and after spreading it about 3 ½ inches thick, we immediately covered it with plastic," says Marlinghaus. We transferred the art project onto block paper and taped it on top of the plastic. Then, working in individual sections, we applied the integrally colored ultra-fine pervious concrete at a thickness of about ½ inch over the base pervious concrete while it was still fresh." The next day, Marlinghaus removed the forms separating the sections and installed a dark grout between them. Marlinghaus says that there are a couple of unique qualities about ultra-fine permeable concrete vs. conventional permeable concrete. "Perhaps the biggest is that it is so fine, it almost appears like regular concrete, yet it can drain at almost the same rate as standard pervious concrete. And because of the way it is applied, a number of design options open up, including the use of interesting colors. Simple borders and designs or accents can be done in multiple colors at a reasonable cost." Another advantage is that the color will last longer and look better, he adds. "That's because this concrete can easily and economically have an 8% color loading vs. the 1% or 2% that is typically used in typical full-depth concrete." The ultra-fine permeable mix is suited for a wide variety of applications, beyond garden art. "We have been installing it for years in every residential application, including driveways, patios and paths. It would also be great for city sidewalks, schools, and commercial and retail applications," says Marlinghaus.